This is an important document to read and to bring to policy makers. New biologically based RF exposure limits proposed in the BioInitiative 2012 Report are 1 million times lower than current FCC limits and would protect against the biological effects found in nearly all of the 67 studies. A single Smart Meter on a home can produce RF exposure levels that caused the biological effects found in either most or many of the 67 studies, depending on the distance from the Smart Meter. A single Smart Appliance in the home can produce RF exposure levels that caused the biological effects found in nearly half or fewer of the 67 studies, depending on the distance from the Smart Appliance. Multiple Smart Appliances in a home multiply the total exposure. 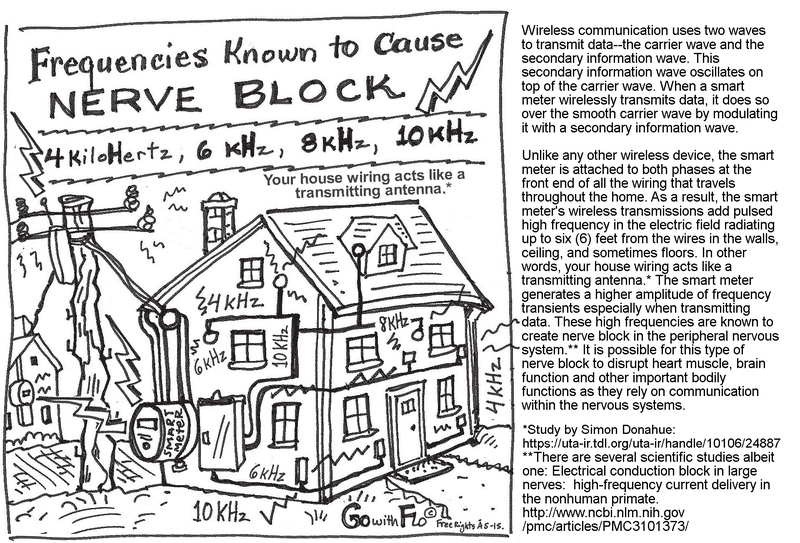 A single Smart Meter on a nearest neighbor’s home can produce RF exposure levels that caused the biological effects found in many of the 67 studies. A given home may have one to eight nearest neighbors, each with a Smart Meter, multiplying the total exposure in the given home. For some locations in a given home, the distance to a neighbor’s Smart Meter may be less than the distance to the resident’s own Smart Meter. Thus, a neighbor’s Smart Meter may be the principal source of radiation for some locations in the given home. The Biological Effects Chart shows that a single Smart Meter can produce RF power densities found to cause biological effects even at distances greater than 20 meters, and certainly up to 100 meters. And the number of neighbors within that range can be large. A given single-­‐family home in a residential community may have one to eight nearest neighbors, and even more next nearest neighbors, all within 100 meters (328 feet) of a given home, and each with a Smart Meter. The problem of exposure from the neighbors’ Smart Meters becomes more serious as the distances between adjacent homes, and thus the distances between adjacent Smart Meters, get smaller. So, generally speaking, residents of townhouses will receive more radiation from their neighbors’ Smart Meters than residents of single-­‐family homes. And residents of apartments will receive even more radiation from their neighbors’ Smart Meters, depending on the location of the Smart Meters in the apartment buildings. 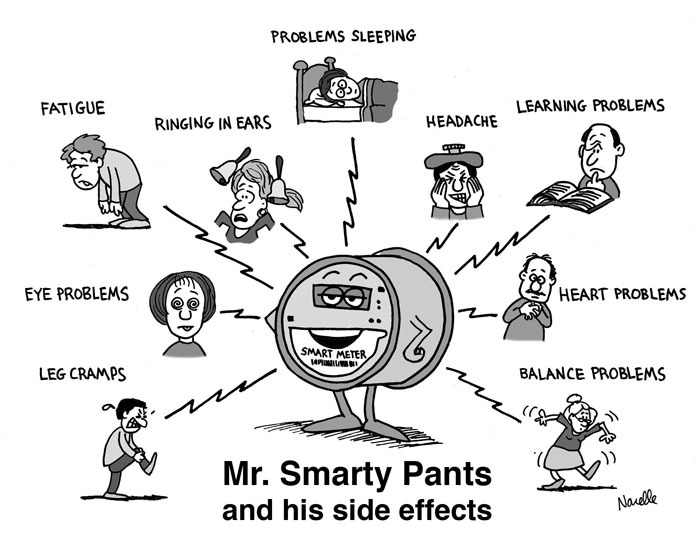 So Smart Meters are a community concern, not just an individual concern. To resolve the problems of RF exposure for a given home, it will be necessary to address all of the Smart Meters near that home. Smart Appliances, too, contribute to this concern. While, individually, they have a lower RF power output than a Smart Meter, the Smart Appliances of neighbors can also increase the RF exposure in the given home.